I’m roughly a half month late in reviewing February, but it’s still fresh enough to allow me to rate my progress. It wasn’t a great month for progress on some personal fronts, but still, I need to hold myself accountable. February was tough. I reached my initial goal and celebrated by loosening the restraints a bit and SURPRISE (Not), the weight wants to come back! The takeaway for me is probably that the diet I was on works, but it’s awfully restrictive and my body is quick to return to it’s default state. Additionally, the weather around here has been uniformly ugly, so since most of my exercise is outside walking and that wasn’t happening, I shouldn’t be surprised I struggled. I got side-tracked and have not been as focused as I’d like to be on this goal so I’m going to be hard on myself and say I didn’t really meet my expectations. Read a book on questions to think about as you approach retirement. I won’t mention the specific book because I don’t think it was great and was really focused on a specific sub-section of potential retirees and much/most of the content didn’t really apply to me well, but I still take credit for the read. I’ve got one queued up (Leatherworking), but I need to sit down and write it. I can’t take much credit since all I’ve done is prep pictures, but I’m still on track for the goal for the year. I volunteered at an work-sponsored event at the Children’s Book Bank which was great. Additionally I gave blood this month. The aggregate score gives me a B-, but I’ll allow the Extra Credit Goal 5 to nudge myself up to a B. A generous B. Don’t let it happen again, me, okay? 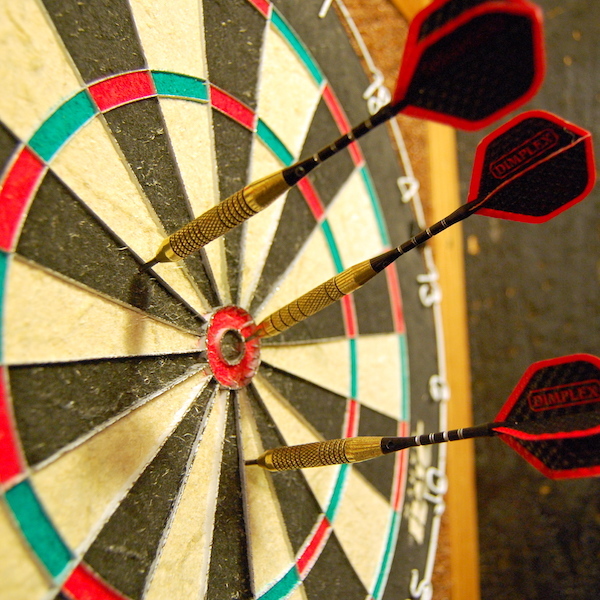 Image courtesy of https://commons.wikimedia.org/wiki/File:Darts_in_a_dartboard.jpg and is a Public Domain photo.